Very Good. 0060934913 ALL BOOKS SHIPPED WITHIN 1 DAY OF PURCHASE! New. Sewn binding. Cloth over boards. With dust jacket. 288 p.
sums up the ups & downs of a "FANTASTIC" profession!!!!!!!! I am a lifetime restaurant Chef who bought this book for my new fiancee, because I felt it was only fair for her to know what the seamy underside of the restaurant business is all about. Additionally, this book pulls no punches in accurately describing the lifestyle (or at least the one at the time) of a cook becoming a chef. I felt as if Anthony Bourdain had told my life story when I first read this, except he is an East Coaster and I am from California. This book is as real as it gets and I highly recommend it for anyone going into the business, anyone who knows someone in the business or anyone who wants to know where their food comes from. A fascinating tour through the world of professional cooking and "chefdom". 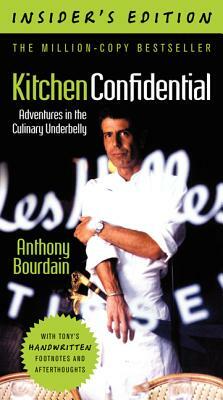 Whether on TV or as a writer Anthony Bourdain is entertaining and also enlightens. I'll bet he's a great cook, too. Gritty and raw--definitely not for the fainthearted or prissy. An insider's look at a unique subset of American culture--the kithchen staff. After reading this I will SOO appreciate the work that has gone into preparing my meals (especially in those restaurants that don't have standardized menus across the nation). I haven't caught Bourdain's show but I enjoyed his writing style although it got to have that "same ol', same ol'" feel after a while (hence, only a 4 star review). I have to confess, I didn't read the last 20 pages or so before whipping out this review but feel I still have a good feeling for the book. I highly recommend it for all you foodies out there or for anyone who is interested in becoming a chef or going into the restaurant business.